Blowout Sale! Save 100% on the Aspectek Sticky Dome Flea Trap with 2 Sticky Discs. Odorless, Non-toxic, Natural Insect Traps, Safe for Indoor Use, Children and Pets - 2 Pack by Aspectek at The Net Stores Network. MPN: 43237-2. Hurry! Limited time offer. Offer valid only while supplies last. Description The Trapest Sticky Dome Flea Trap lets you control fleas in your home and on pets without resorting to potentially harmful chemicals. The Trapest Sticky Dome Flea Trap lets you control fleas in your home and on pets without resorting to potentially harmful chemicals. 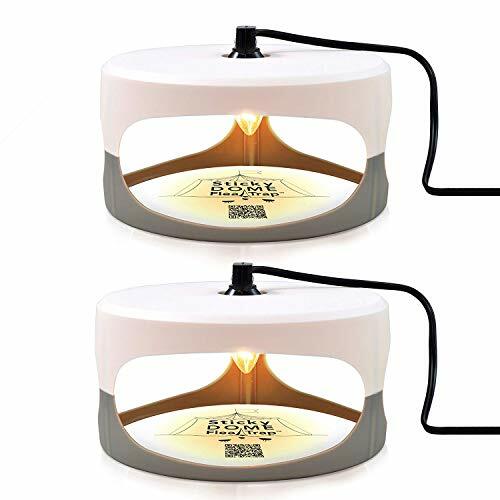 The Trapest Sticky Dome Flea Trap monitors and controls flea infestations by using light, heat, and powerful sticky traps to catch and trap fleas. The Trapest Sticky Dome Flea Trap controls indoor flea problems by simulating the warmth of a tasty meal and luring fleas out of furniture and carpeting. The heat and light leads the fleas to the sticky trap pad, ending the flea's biting days. The Trapest Sticky Dome Flea Trap is non-toxic and odorless, making it safe to use around children and pets. Trapest Sticky Dome Flea Trap refills can be stored for up to 12 months so the trap is ready to go if an infestation should reoccur, making the Trapest Sticky Dome Flea Trap an economical option for pest control in the home. NON POISONOUS - 100% effective indoor flea control solution. Natural and odorless glue trap. Safe to use around children & pets. EASY USE - Easy & Safe to use around children and pets. Plugs into any standard household outlet for convenience and portability. TRAP ATTRACTION - Trap is effective as it uses color, heat, light, and sweet odor to lure fleas; attracts fleas from 50 feet away in every direction. HIGHLY CREATIVE DESIGN - Patented design, CE and ROHS rated for safety and quality. Super Grabber glue holds fleas fast for easy monitoring and removal. 2 PACK: Package includes 1 trap and 2 glue discs, with refills readily available.